This Snail-Bot appears during Green Hill Zone in the Beta. It has a similar pattern to "Motora" in Sonic 1, but if you get too close to it, it will charge at you. It will follow you for some time too. From Digitizer Images that Tom Payne gave to the community, we can see that the Snail enemy was once very different berofr it was taken out entirely. It would sit on the side of a wall, and once you had passed it, it would jump off and roll after you, sort of like a mixture between the Snails from Sonic 3, and Armas from Sonic 1. They were also intended for Hill Top Zone before they got moved to Emerald Hill. 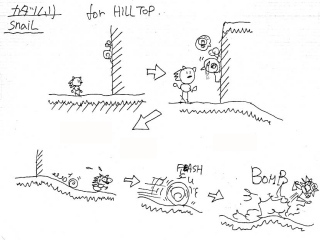 These sketches show how the Hill Top snail was going to work. It was probably taken out due to the overall complexity of the enemies movements in comparison to others. Click the image for more sketches of the Snail enemy. From Digitizer Images that Tom Payne gave to the community, we can see that the original Wasp (ie; "Stinger") enemy had an extra animation. It would expand its lower half before shooting at Sonic or Tails. This is the Wasp enemy we see in Sonic 2 Beta. It doesn't have that extra animation seeing above, and although not noticable at first, it's head is a different shape to the final one. The fireballs are also different to those on the digitizer. These is the final wasp animations The head is not a bit squarer, the eyes have been diluted, and the engines on it's back have been altered slightly. Tom Payne has said that Yasushi Yamaguchi touched it up during the final stages. This fire is theorized to be the remains of a log bridge in Emerald Hill Zone. 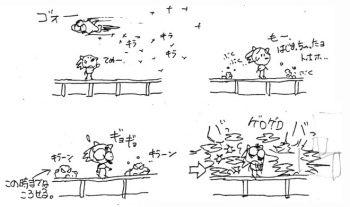 As seen in the sketches below, The Wasp enemies would burn down bridges to create new paths. 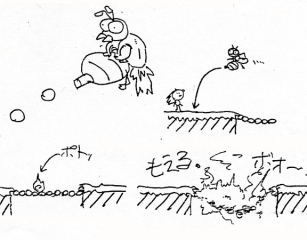 These sketches show that the originall "Bee" (later Wasp) enemy was more complicated than the final version has you believe. Not only would it shoot at you like Beeton's did back in Sonic 1, but you could also manipulate them to shoot down bridges so they would open up a new path for you to follow. Click the image for more sketches of the Bee enemy. This contraption was meant to be used in Chemical Plant Zone [known back then as "Checmical Factory"] when underwater. It's called the "Mother Bubbler", or "Bubbler's Mother", and it would swim around and drop enemies called "Bubblers", in a similar way to how the Bat robots from Sonic CD's Collision Chaos Zone drop sparkles down from beneath them. This 'Bubbler' would be dropped by the "Bubbler's Mother" above, and sit on the ground. It would then explode. and gas would pop out, hurting Sonic. 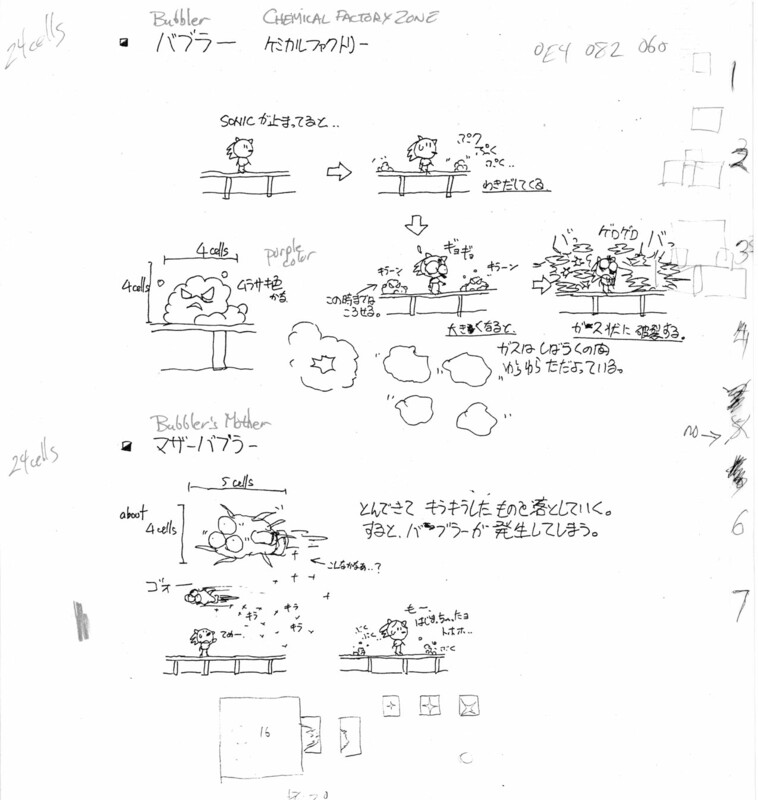 These sketches done drawn by Yasushi Yamaguchi show how the Bubbler and the Bubbler's Mother were meant to work. The Bubbler's Mother would scroll across the screen, dropping bubblers, which would then rise from the ground and explode, sending gas into Sonics path. Click the image for more sketches of the Bubble and Bubbler's Mother. This is the missing 'Crocbot' robot, noted in the Sabaku Zone image in magazines, but with it's full body. It would roll along and then attack. This peculiar ball was found, and may have been a projectile at some point. This display of images were drawn by Yasushi Yamaguchi, who also drew the images inside the Japanese Megadrive Manuals. Here we can see just how the ball was meant to be used. It looks like it was meant to be a distraction, rather than an enemy. 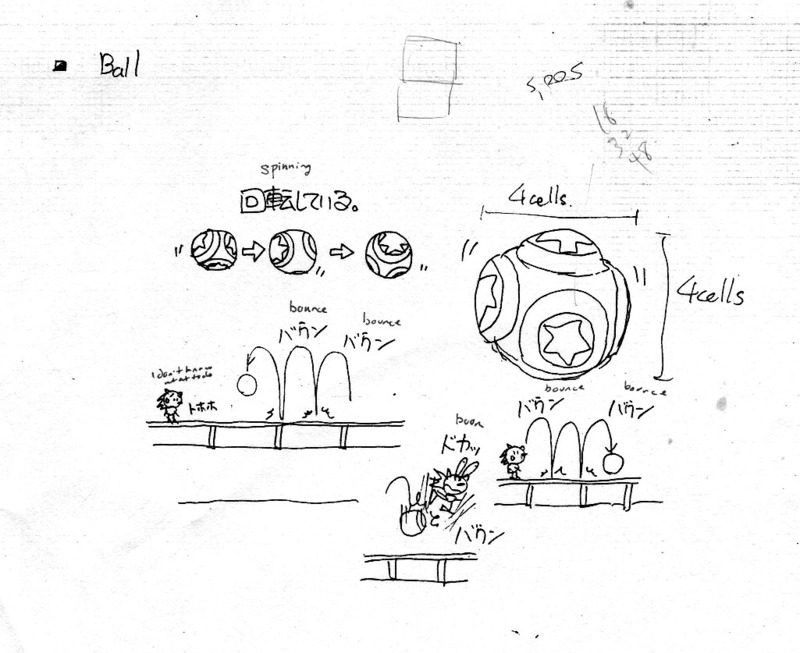 Click the image for more sketches of the Ball. This "Guardon" badnik appears in the final game, but not this animation. It's as if it's stopped in it's place, or turning. The final simply uses another animation. 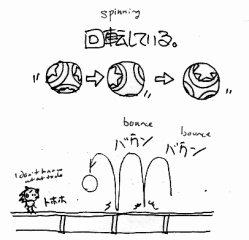 A very early look at an enemy called "Banper", or "Bumper" in English. Originally it was going to be in "Sabuku Zone", the Desert Zone, as well as the "Rock Zone", which would be a Timed Traveled version similar to how Sonic CD worked. This is clear evidence that Time Travel was originally intended for Sonic 2. 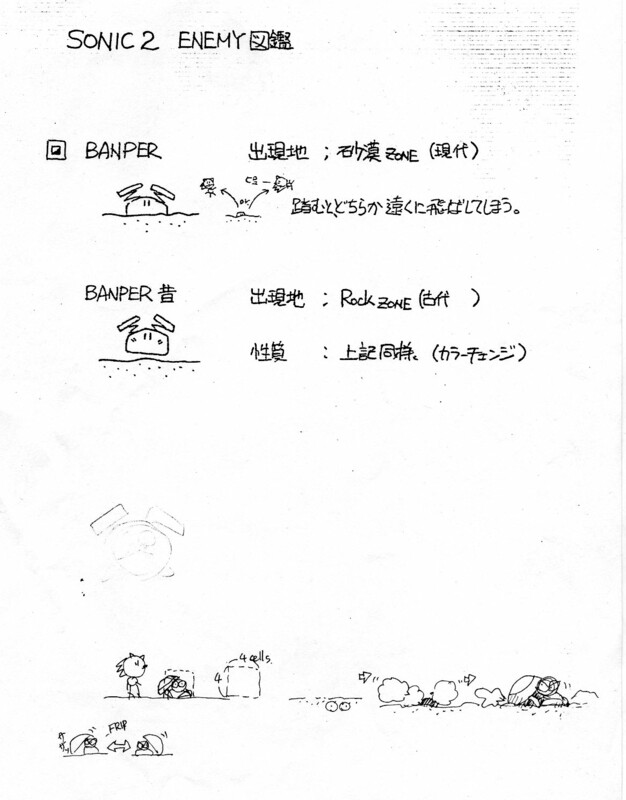 This scan also shows that "Banper" turned into "Guardon", except he too was in Sabuku Zone. He would originally hide in the sand and come out with his shield. From what we can tell, it looks like This version was virtually indestructable, since he could also flip sides. In the final game, you can get him from behind. Click the image for more sketches of the Banper. This Piranha bot was found while digging through the prototype ROM. It appears that it may have been a bigger version of the "Kapu Kapu" Piranha robots in Sonic 3's Hydrocity Zone. The Triceratops robot was seen in an early image of Hidden Palace Zone. It moves similar the Green Hill Zone Snail Robot. This Octopus appears in the final game, but it was found that there were two versions of it. This one will shoot you and float away horizontally. The is an alternate Seahorse found within the prototype ROM. It has a rocket attached to it's back, unlike the final which has nothing. It has a very different move set as well, as it will dive towards you if you get too close. It's eyes are a bit more oval too. The Seadra to the right is the final version. 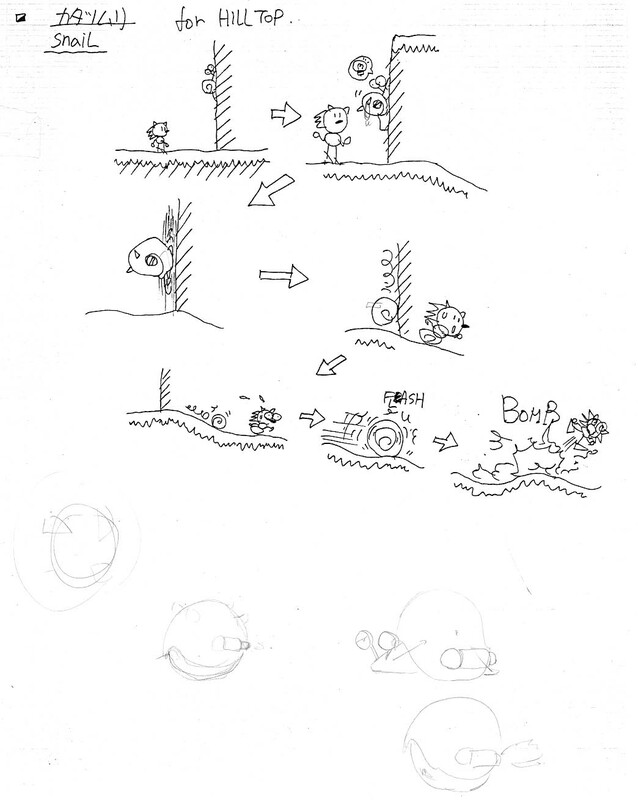 One page of the sketches show that there was a Frog enemy being created, assumdely for Green Hill Zone, but it could just have easily been Aquatic Ruin. It would hop around, and when you got near it would jump higher, distracting the player. 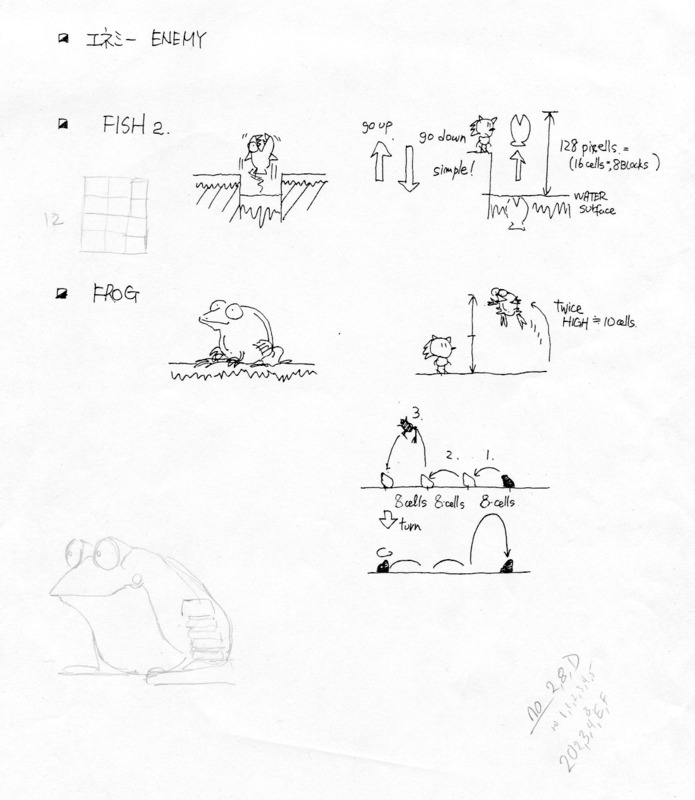 This also shows 'FISH 2', which ended up being Gabuccho enemies. 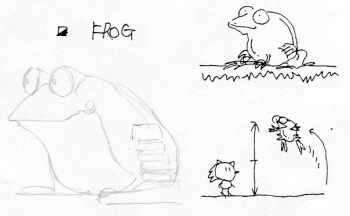 Click the image for more sketches of the Frog enemy. These sprites are in no way official. Blaze went ahead and tried to recreate the Frog in sprite form.